QB strangling used to be legal. SEE THAT GOODELL? Each week, commenter Stu delights you by making you remember a Minnesota sports figure previously buried deep in your memory. Stu? 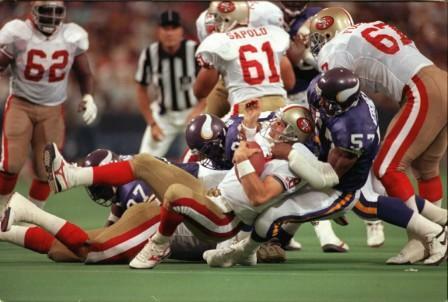 Claim to Fame, Minnesota: linebacker for the Minnesota Vikings from 1989-1992. Led the team in tackles in 1990 and 1991. Claim to Fame, Everywhere Else: was a 3rd-round draft pick of the Pittsburgh Steelers in 1982, and made three Pro Bowls while with them. He held out the entire 1988 season in a contract dispute, which led Pittsburgh to trade him to the Vikings for the Purple’s 1st-round pick in 1989. They used it to select offensive lineman Tom Ricketts, who only played three years for the franchise. See, not ALL of Mike Lynn’s trades were bad. Merriweather is also an alum of the University of Pacific. See, not ALL of the people who went there are stiffs. Where He Is Now: sells insurance in Stockton, California. Was unable to confirm if he’s met Stockton natives Stephen Malkmus, Chris Isaak or Dallas Braden before this Hunt Down went to press. Is He on Twitter: there are a handful of Mike and Michael Merriweathers on the Twitter, but results are inconclusive. RS: Holy cow, you’re Mike Merriweather! RS: Wow, hey, remember when you were on the Vikings and you blocked that punt in overtime to beat the Rams? MM: Yes, I do. Big win for us. RS: Do you remember that Rich Karlis kicked, like, a billion field goals in that game? MM: Yes, hard to forget that. RS: WHY DIDN’T THEY FIRE BOB SCHNELKER RIGHT THERE ON THE FIELD?!!?! MM: I need to go now.